THE World Cup giant-killers have struck again. After downing Pakistan in 2007 and England in the 2011 tournament, Ireland added the West Indies to its growing list of scalps, cruising to a four-wicket win in Nelson with 25 balls to spare. Ireland coach Phil Simmons, who played 26 Tests and 143 ODIs for the West Indies, would have been pleased with captain William Porterfield's decision to field after his side picked up five early wickets, three to spinner George Dockrell. Ironically it was Simmons' nephew Lendl Simmons who came to the rescue, blasting 102 off 84 balls to take the West Indies from 5-87 in the 24th over to 7-304. That proved no trouble for the Irish, who were cruising at 3-273 with more than 10 overs to spare, before a late flurry of wickets caused a few nerves. 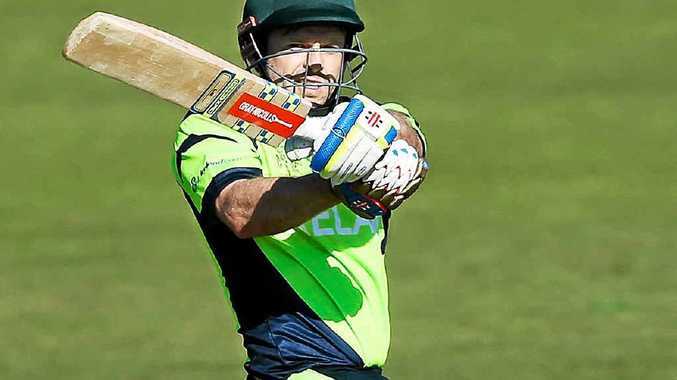 Top-order batsman Paul Stirling (92 from 84), Ed Joyce (84 from 67) and Niall O'Brien (79 not out from 60) flayed the bowling to all parts of the field to set up the win. The loss means the West Indies will have to beat either South Africa, India or Pakistan to progress to the knockout stage of the tournament. Ireland will have a great chance to move through for the second time if it can beat the UAE and Zimbabwe.